Are You Now or Have You Ever Been a Climate Skeptic? And one of the Magnificent Seven is . . . me! 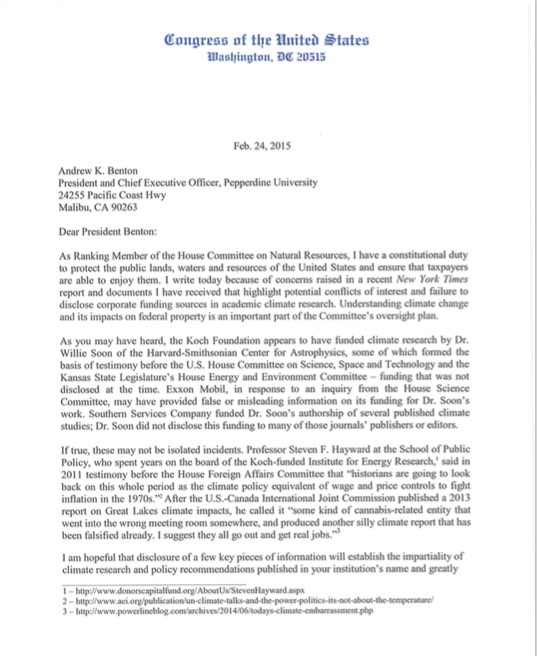 I have to say I’m flattered to have been elevated to the ranks of Richard Lindzen, John Christy, Judith Curry, and Roger Piekle Jr. as all-stars in the climate field, and it was very nice of them to aggregate all of my congressional testimony (a grand total of five times in 15 years—yeah, that really makes me a “go-to” guy doesn’t it?) in one location (scroll down to the bottom). You can see Grijava’s letter about me nearby, or download it here if you’d like your very own copy. (Send it to me with a self-address stamped envelope, and I’ll autograph it for you!) More seriously: it appears I’ve really gotten under the skin of the climate cultists (almost certainly Greenpeace, the John Birch Society of the environmental movement, is behind this). 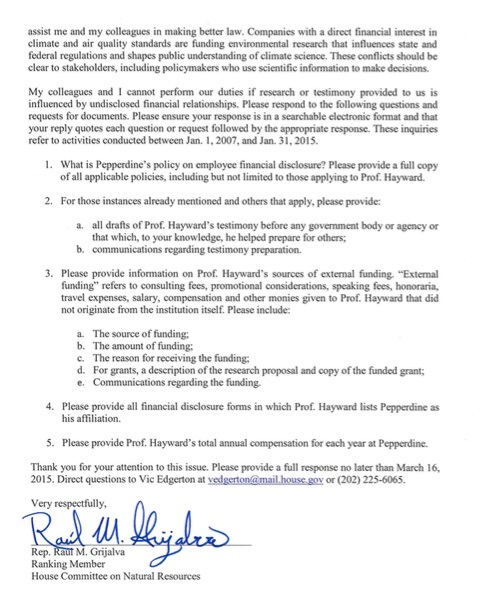 Pepperdine’s administration will produce their own proper response since the letter is addressed to them rather than to me, but Rep. Grijalva and his McCarthyite witch hunters are in for a disappointment: there are no undisclosed financial supporters of my writing. I’ve received—and am receiving—no grants, honoraria, consulting fees, good karma baubles, or even Christmas cards from any fossil fuel interest, though I’d be proud and open about it if I did. And I didn’t consult anyone for the content of my congressional testimony over the years, though so what if I had? Is the good congressman really telling us that he is incapable of assessing factual claims and judgments about the wisdom of policy on the merits alone? That doesn’t speak well of his probity. I do hope the House Committee on Natural Resources will hold a hearing on this topic, because I’d love to ask Rep. Grijava some questions in return, such as which contacts at Greenpeace ginned up the particulars of his complaint (since I doubt the worthy Rep. or his staff actually read Power Line, which is cited in his letter). Further, it will be fun to ask a series of questions about the incentives of government-funded scientists, such as what might happen to their government research grants if they didn’t report a result congenial to Rep. Grijalva. More to the point: why pick on the seven of us at universities? Does he really just say “how high?” every time Greenpeace asks him to jump? Got to hit the road for the rest of today and tomorrow, but I’ll have much more to say. In the meantime, Roger Piekle’s response is classic, and exposes the full dimensions of the absolute ritual conformity demanded by the climate cult today (since Roger is not a climate skeptic in any way, shape or form).